Yes.. Where is the love for WP7? Leebopsicle: Thought I'd post my experience so far. filled mine yesterday morning but got no confirmation date yet.. I hope I will receive this today and get connected by tomorrow (before weekend)..
Hi BigPipe, just wondering what I will be switched today with your service. I received the email last week that I should be switched today... plus Chorus for some reason called me that all good from their side. thanks again! excited to test Netflix on my ps3..
Getting mine connected on Thursday, going to run some tests to see the before on my Telecom VDSL connection is and after. Impressed with how quickly they're getting things moving! no worries. How is your Netflix now? I had a quick test earlier and it was all good!!! no more buffering! I will try this evening again and see how it goes but yeah, no more buffering issues! definitely telecom issue!!! thanks BigPipe! you are a life saver! Im very pleased to say that I am happy with BigPipe and can now watch netflix in SuperHD in just few seconds! (with the help of Getflix.com.au) unblock-us unfortunately is having some issues atm - tried doing tracert on both DNS services and unblock is about 26 hops before it reach netflix and high latency while the other one is completed in 15 hops and lower latency. 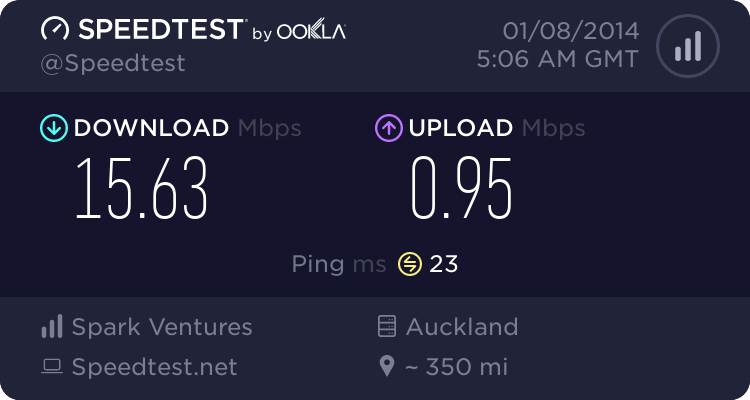 BigPipe, currently I am getting 22/3 (down/up) with my vdsl - is there any chance you could reset my DSL profile and train again... or maybe something we can do to make my upstream a bit higher? I'm 1KM away from exchange. Chrizvi: Im very pleased to say that I am happy with BigPipe and can now watch netflix in SuperHD in just few seconds! (with the help of Getflix.com.au) unblock-us unfortunately is having some issues atm - tried doing tracert on both DNS services and unblock is about 26 hops before it reach netflix and high latency while the other one is completed in 15 hops and lower latency. Sounds like your issue is simply the fact your so far away from your exchange / cabinet. What is your attenuation by chance? when I was on ADSL (3 days ago) i get Attn of 8.5/20 (up down) while on VDSL I get attn of 57/22 (up/down). huge difference on up attn. so that's maybe the reason I only get 3Mb upstream..
Been hooked up to the ADSL plan for about a week now. Not much to say, was connected incredibly quick and it's been just as solid as my old telecom connection so far.